We invite you to explore India - the Land with infinite beauty ! Whether you soar high into Himalayas or peer under the ruins of the Ancient monuments dotting the landscape of India, you will cherish the experience long after your visit ! 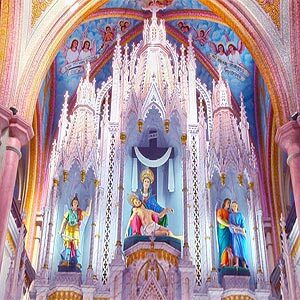 This India Travel Guide on Basilica of Our Lady of Dolours is free from any commercial interest! This site is dedicated to promote India - the vast subcontinent, its glorious past, magnificent landscape and its infinite variety. Basilica of Our Lady of Dolours (Puthan Pally) is the biggest church in India and the tallest church in Asia situated in Thrissur town in the state of Kerala. This church was built on an area of 25000 sq ft, in the year 1925 with the support and guidance of then Maharaja of Cochin, His Royal Highness Rama Varma. It is well-known for remarkable Gothic style architecture and three mammoth towers, two in the front and one in the rear. The towers at the front are 146 ft tall and the Bible tower which is located at the rear end is 260 ft in height, lending the structure a majestic appearance. Mar Francis Vazhappilly, the Late Bishop of Thrissur, planned a new church after closely observing the architecture of the churches at Rome and Europe. Then he laid the foundation stone of the Shrine Basilica of Our Lady of Dolours on 21 December 1929 and consecrated the Church on 24th November 1940. 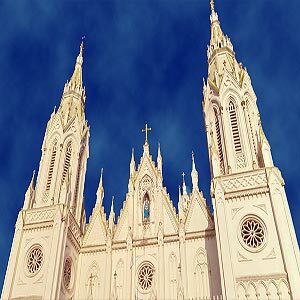 Though construction of the church went on for several years and was completed in different phases, it turned out to be a finest masterpiece drawing people in large numbers for its splendid beauty as well as sanctity. On 25th April 1992, the church was raised to the status of Minor Basilica by the Venerable Pope John Paul II. Thereafter the church has come to be called Basilica of Our Lady of Dolours or Puttanpalli. The Bible tower was inaugurated on January 7, 2007 and His Excellency Most Reverend Dr Pedro Lopez Quintana dedicated this architectural excellence for World Peace. One can have a panoramic view of the entire Thrissur town from the Bible tower. This tower depicts the whole life of Jesus and houses the Christian art gallery. Do not miss a brass etching depicting the miracles of Jesus. Representative murals and paintings are replete with images of the infancy of Christ and passion of Christ. This gallery is first of its kind in the Kerala region. Working hours of the Bible tower is from 10 am to 6 pm, from Tuesday to Friday and from 10 a.m. to 7.30 pm on Saturdays and Sundays. The tower remains closed on Mondays. The entrance to the church looks magnificent with towering belfries. The ceiling of the church is adorned with astonishing mural paintings, images of saints and scenes from the scriptures. The main altar is about 100 feet high and five altars are placed on either side of the main altar. The main altar houses the statue of Our Lady of Dolours along with two beautiful statues of the Holy angels Raphael and Michael. There is a gigantic dome with four spectacular pillars just above the main altar and beneath this altar lies the tombs of mortal remains of the bishops. The ten altars on either side of the main altar have the statues of St. Francis Xavier, St Thomas the Apostle of Christ, Christ the King, The Holy Family, St. George, St. Joseph, St. Antony, St. Sebastian and St. Maria Gorethy. There are eight German bells in the adjoining belfry that produce the musical notes. You can hear the tones of 'Ave Maria' (Hail Mary for any Roman Catholic) every day morning and evening. Many believers offer prayers at Perpetual Adoration Center every day. The main feast of the church is celebrated on the last Sunday of November every year. This feast is the second biggest festival of Thrissur. Visitors can view the wonderful illumination of the Basilica of our Lady of Dolours at this time.